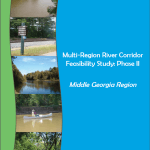 The Multi-Region River Corridor Feasibility Study examines, in detail, the feasibility of establishing linkage and connectivity, to the greatest extent possible, through the use of multi-use trails, greenways, conservation areas, and recreational facilities along the Ocmulgee River and the Oconee River. Starting in Athens-Clarke County and ending at Jackson Lake in Butts County, the proposed river corridor would seek to connect significant historic, cultural, and environmental resources while accentuating the history and uniqueness of the surrounding areas. As indicated in the title, this study is multi-regional in nature, in that it encompasses the service area of four Regional Commissions: Northeast Georgia Regional Commission, Middle Georgia Regional Commission, Heart of Georgia Altamaha Regional Commission, and Three Rivers Regional Commission. Through funding made available by the Georgia Department of Transportation (GDOT), each of the affected Regional Commissions contracted with GDOT to accomplish the study in two phases. Phase I of the study was accomplished in 2011 and contains primarily a descriptive inventory of river corridor resources and assets. Phase II, completed in 2012, presents a comprehensive analysis of the results of the inventory, and offers specific strategies for successful implementation.